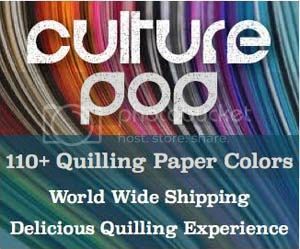 Today I want to highlight a great paper quilling shop – Custom Quilling! Several months ago I signed up to be an affiliate of the shop and last month I finally started putting some links in some of my posts. The reason I am excited to be an affiliate for this shop is so I can point all of you to a great place to get your supplies from! (disclosure: I receive a small percentage of store credit purchases made through the affiliate links). The shop is based in the US, and ships worldwide. Just choose your country during checkout! Today I want to highlight some of the unique products you can find at Custom Quilling that you might not be able to find at every quilling shop! Custom Quilling recently started carrying PPA glues! She has both matte and glossy in a variety of sizes available. If you have been reading this blog for awhile you already know that is it one of my favorite glues and is the one I use daily for my own quilling work! This Paper Bead Adhesive Sealer looks great and is definitely on my “to try” list! They also conveniently carry The Ultimate water based super glue, which is a great glue! I’ve used this for quilling as well as for things like gluing quilling onto metal and plastic items. A non toxic super glue is always awesome to have around! But enough of glues/sealants. Check out this fun Shape Quilling Board! And check out this cool Snow Globee that you can add your quilling to! There are other things as well such as start and teardrop shaped ornaments to add quilling to. I’ve never seen a ruler like this Perfect Paper Ruler before. Looks like it’d be perfect for cutting your own quilling strips because it won’t slip out of place! There are some really neat new card/envelope sets as well. This one has a swinging heart! These new dome cards come with covers to protect your quilling so it can’t get squished! I always find it fun to see the new types of tools coming out. 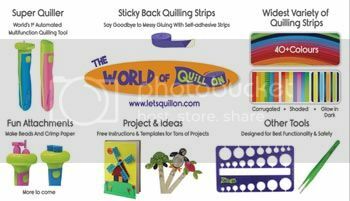 Here are a couple new quilling tools! This slotted tool has a cap. Good for travel, you could put it in your purse without worrying about it poking something! This fun new tool is the talk of the town! It is called Quill Ease and is motorized, great for those who get sore hands/wrists from hours of paper rolling. I like that it also has a base that can help you lift the roll from the tool so that it comes off cleanly without ruining it! It is available for pre-order right now and it says it’ll come in at the end of August. You can find other tools as well, such as this paper bead roller, another craft similar to paper quilling. You can also find all the materials needed to make paper beads! A good cutting mat is necessary for someone who often does paper quilling and any other paper crafts! Usually you need to go to another store to get this, so it is handy that Custom Quilling sells it right alongside their quilling tools! This shop sometimes sells products that you normally wouldn’t think of as typical quilling tools, but they can be adapted as such! This sizer can be used to make open rolls for quilled jewelry or other designs, or can be used to help form cone shapes for 3D quilling. Quilled Creations seems to come up with great new products almost every year! One of their newest is the Border Buddy. Use the Border Buddy (see this post for how to use it) to easily make open circles, squares, and triangles! Another new product from Quilled Creations are these handy round magnets – turn your quilling projects into adorable fridge magnets ! With 100 magnets per package, it’s a great deal! Fringers can be a bit of an expensive investment, but no longer with Quilled Creations new fringing scissors! Speaking of fringing, if you make a lot of fringed flowers you probably want to invest in a proper fringer. This new safety fringer looks amazing! Other unique papers that are carried here are different colors that have metallic edges. For example, you can get cream paper with copper metallic edge, leaf green paper with metallic green edge, pink paper with metallic pink edge, and many more! I could go on and on, and this is an amazing shop, but I’ll stop for today. Check out some of these great products and I guarantee you’ll start browsing the shop and see all of the other amazing things she carries! Oh, and if you have a cutting machine, there is a wealth of awesome dies available to go with your quilling projects! Happy browsing, and I hope you are all working on some fun quilling projects this week!